In this review I will explain the advantages and disadvantages of the online tutoring platform Wyzant. Many of my students asked me questions like “Is Wyzant tutoring a scam?” or “Is Wyzant tutoring worth its money?“. First, I would like to stress out that I have neither taught as tutor on Wyzant, nor have I had classes as a student there, but I do have students of mine who are using or have used Wyzant for tutoring lessons. Below, you will find an in-depth review about Wyzant as a language learning platform. I will discuss how much value this tutoring platform brings to students, for which levels it is suitable, how the payment works, some minor drawbacks you can find within it, and where to sign up for starting on this language platform. Best deal: Redeem your coupon for $20 in free tutoring! Wyzant is a learning platform where you can find a tutor and get 1-to-1 classes. You can choose among 300 offered subjects and skills taught by more than 80,000 tutors. The process is easy: You sign up, choose your subject and tutor, book the lesson and finally you have to pay for the class. The sign up process in Wyzant is quite straightforward and fast. It will only take you a few minutes. First you have to go on the website of Wyzant and click in the upper right corner on SIGN UP. You can choose between signing up with Facebook or your e-Mail address. Personally, I always prefer to sign up with my e-Mail address, but this is up to you. In the next step, you will have to add your full name and ZIP code of your residence. There is an important note here: At the moment, it is only possible to sign up with a ZIP code from the United States. The reason for this is that Wyzant tries to find tutors that live close to your place and so far, this is only possible in the United States. However, don´t worry if you are no U.S. resident. You are not lost 😉 Just type in a random number as ZIP code to be able to register. Afterwards when it comes to choosing a tutor and a lesson, you only have to choose “online lesson” and the ZIP code won´t matter anymore. Before finally being able to schedule your lesson, you need to add a valid payment method. You can choose between PayPal or CreditCard. Once you enter your preferred payment method, you are ready to go. Now you can choose the subject you want to learn and find your tutor. Once you finish the account set-up you are ready to go and you can search for suitable lessons. At the top you can find the menu bar. By clicking on “Find A Tutor” the drop-down menu opens and you can click on “Search for Tutors”. In the next window you will be asked what you want to learn. In your case, most certainly it will be European Portuguese. Please really type in the “European” otherwise it will show you a lot of tutors that speak only Brazilian Portuguese. Moreover, you have to add your ZIP code. As mentioned before, you can use a dummy ZIP code in case you are not based in the United States. After clicking on NEXT you will have to add the current grade you are in (or Adult if you left school already ;)), when you need help and your preferred hours for getting lessons. Last but not least, you will be asked if you want to have classes online or face-to-face. Well, this is up to you, but if you are a non-US resident, you might go for the online lessons. You will receive the results with all the tutors that fit to your search requirements. Moreover, you can see the hourly rate of the tutor, the average rating and how many hours of classes the tutor has given already. By clicking on the tutor´s profile you see more details and you can choose your favorite. Now, you have to contact the tutor and you can introduce yourself briefly. Please note that you can also tick a field when setting up your account where it says that you want Wyzant to send you suitable tutor suggestions. This works in fact, and they will get contacted by several other tutors. However, not all of them are teaching European Portuguese. It is recommended to ask the tutor if they are really teaching European Portuguese before signing up for the class. Once you found your favorite tutor, contacted him or her and agreed on having classes, you have to book a lesson. The tutor will propose some free time slots, so you can align with him/her the best date and time. Be aware that there might be different time zones, so be clear about this and let them know where you are currently living and in which time zone you are. Please note that in addition to the hourly rate of the tutor, a 9% service fee of Wyzant will be charged. I advise you to make some simple preparation for the class. Check if your internet is stable, your sound and micro works and you have a calm place to attend the class. You can have the classes either in Skype or directly on Wyzant. If you choose to have the class directly on the language platform, you simply can go to your Dashboard. There you will see the lesson with your tutor and you can click on “Join Online Lesson”. I quite like the interface of the Wyzant online tool. Here you can see how it looks once you have the online class. In the right upper corner you can see your tutor and the main window is for showing the study material. You can also handwrite (with the mouse), draw and upload media. Once the class starts, you can also see the timer in the top of the window, so you will know how much time there is left for your class. Once your class is finished and you hopefully learned a lot of new Portuguese words, you should be so kind and give a review to your tutor. You can write what you liked about the lesson and what you talked about with your teacher. Most likely, your tutor will also write you a review. After the class, the tutor will mark the lesson as done and you will be charged the price for the lesson and additionally the 9% service fee to Wyzant. Flexibility: You can choose between online classes, being taught at your home or having classes in a public space. Moreover, you can schedule classes in your preferred hours. That makes learning Portuguese highly flexible and gives you the freedom to study from wherever you want. 1-to-1 classes: Have you ever had 1-to-1 classes? It is quite different from having classes within a group. Usually, the lessons are much more effective and you will see progress much faster. Resources for European Portuguese: When you know how limited the offer for learning European Portuguese in the internet is, then this can be definitely an advantage. Relatively stress-less to find a tutor, as Wyzant is doing the work for you. Good customer support and quick feedback from tutors. For students that want online-classes, the internet connectivity can always be a draw-back when it comes to disfunctionalities and disruptions. The tutor rates per hour are medium to high. There is an additional 9% service fees that you have to pay to Wyzant when you schedule a class. Finding a tutor that teaches European Portuguese and speaks your native language (if you are a non-English native speaker) can be difficult. If you are not based in the U.S. you have to be aware of the different time zones and the availabilities of the tutor. First things first: I can definitely recommend Wyzant as a learning platform for students that want to learn European Portuguese. I am a fan of online tutoring, as I am teaching online myself. The flexibility for the student is great and the 1-to-1 classes have so much impact on the students learning curve. In my opinion, the lessons could be a bit cheaper, but as the company is based in the U.S., the lesson price is probably adjusted to the price level there. Nevertheless, perhaps you can ask your tutor for a discount when you order more lessons in advance. I would definitely ask about this latest after the first class. If you are still not sure, I suggest you give it a try. Sign up and get in contact with a tutor. Try a first lesson and then you can decide whether you want to go for it or not. One more thing: In case you didn´t like your first lesson, you will get your money back from Wyzant! So there is nothing to lose. => Still doubts? Sign up NOW and get $20 for your first lesson. I give you the advice to make a little “pre-check” of your tutor. At the end, you will have a “contract” with the tutor and each of the tutors acts as an independent person, so you have the responsibility to research about the person you choose. You can easily go on the tutor´s profile and check the students reviews and the rating, that will be most certainly already enough to get an idea if everything is okay. Another good advice in case you will have face-to-face tutor lessons, meet the person in a public place for the first lesson. Afterwards, you can still see how you want to proceed. I think mainly you can trust your gut feeling here: when something seems weird or wrong, then it most probably is. But this should not be the normal case, anyways. You can find a lot of students’ reviews on the web. For further reference, you have the review section of Wyzant but you might want to check out a more independent page, e.g. the reviews for Wyzant on TrustPilot. Students gave Wyzant an overall rate of excellent with more than 91% out of 665 reviews. 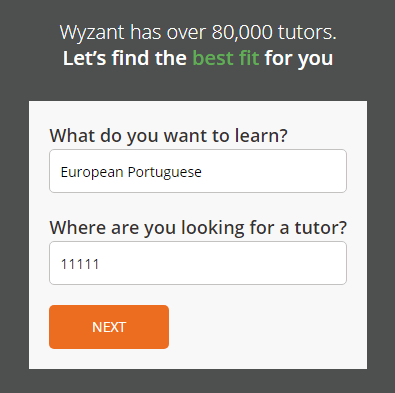 Wyzant is definitely a good way to find a tutor for learning European Portuguese either for online or face-to-face lessons. I recommend having a tutor / teacher to everybody who really wants to learn a new language, as it will help you structuring the lessons and to make your learning path a success. Nevertheless, you also need to be dedicated to it with the right amount of motivation. Tutors can help you achieving your goal faster, but at the end you will have to work for it. I hope you liked my review about Wyzant and you can see that Wyzant is no tutoring scam 🙂 I hope some of you will sign up on the platform and get in contact with a tutor. If you have any questions or you want to add some useful information, feel free to leave a comment. I will reply as soon as possible. In case you have already had the experience with learning a new language on Wyzant, I would appreciate if you would leave your feedback below. This has provided me with a lot of information about wyzant and for that I ma grateful! Ive also though about studying a new language but have always been a little scared to take the leap and wyzant seems like a pretty good place to go. The prices do seem a little steep especially when you include the 9 percent service fee but I guess that’s just the price you have to pay when a website is based in the US. All in all I feel like these could be a good place to go if I want to learn a language online, hopefully in the near future I’ll give it a go. I do hope that you take the leap and immerse on this beautiful world of language learning..you won’t regret I think! Thank you for the great information on what to expect with Wyzant as a language learning platform. I want to learn Indonesian as my partner comes from Jakarta and would like to communicate with the locals. How long do you think this will take to learn through Wyzant and roughly, how much would it cost? Thanks for your comment. I was searching for tutors that teach Indonesian as language on Wyzant and I saw that there are quite a few. About the prices, I am not sure how much would it cost, since each teacher sets their own prices. Therefore, it can be really cheap or more expensive. What is the lesson price without discount? Wait for your respond. Wyzant can be a good option if you are looking for more “serious” lessons. You can also find more teachers on the italki platform here: Learn European Portuguese online on italki. See what suits you best and give it a go! Please come back to my website as well, as I will be adding more content and materials.